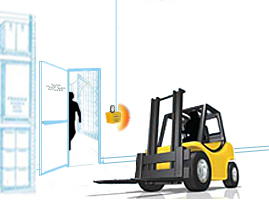 Hall & Door Motion Monitors detect forklift and pedestrian traffic and warn traffic on the other side of an entryway of the potential for collision. 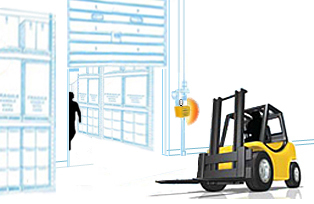 Overhead Door Monitors detect pedestrian and forklift traffic at overhead door access points and warn traffic on the other side of the overhead door to be cautious as they go through the door. 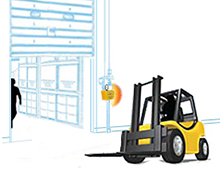 Overhead Door Sensors with Outdoor Boxes detect motion at overhead doors and strip doors and alert pedestrians and forklift operators of motion both indoors and outdoors.